I don’t like figures! Better to say I don’t generally like ordinary figures, and the ones that cost as much as a premium model I won’t buy out of this exact reason. And from another point of view, I don’t really like how figures in a showcase give such a toyish vibe to the entire ensemble. I like a lot more a showcase with a simpler, museum-like aspect. 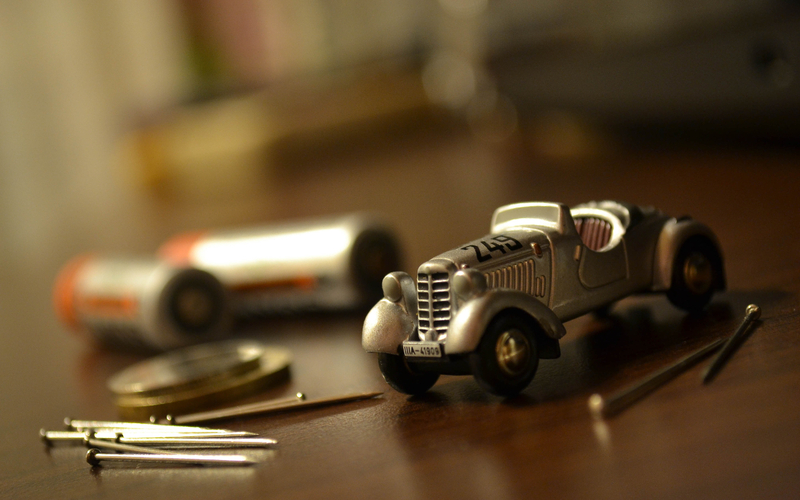 I have a couple figures though, but with specific roles, meaning that they help giving a sense of scale to the non-conventional cars, like the Benz Patent Motorwagen, the Daimler Motorkutsche, the Mercedes Simplex or some of the Silver Arrows. Yeah, but that’s just me. I told you all of that because the subject of this text is a figure that is very dear to me, a figure that doesn’t really fit into my collection, but it is a part of it anyway. 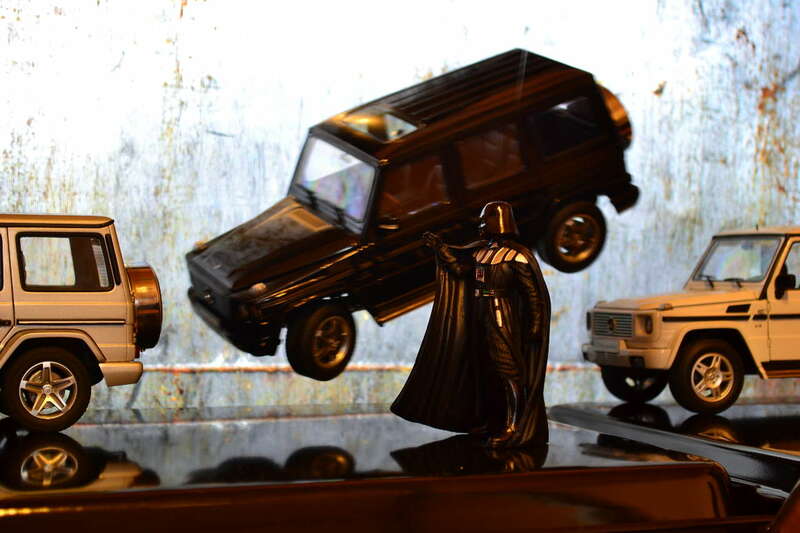 I am talking about my Darth Vader in 1:18th scale. The weirdest thing happened when I was looking around in a bookstore and found this figure (WTF) in the hobby corner, yes, totally unrelated with the store’s general line-up of items. 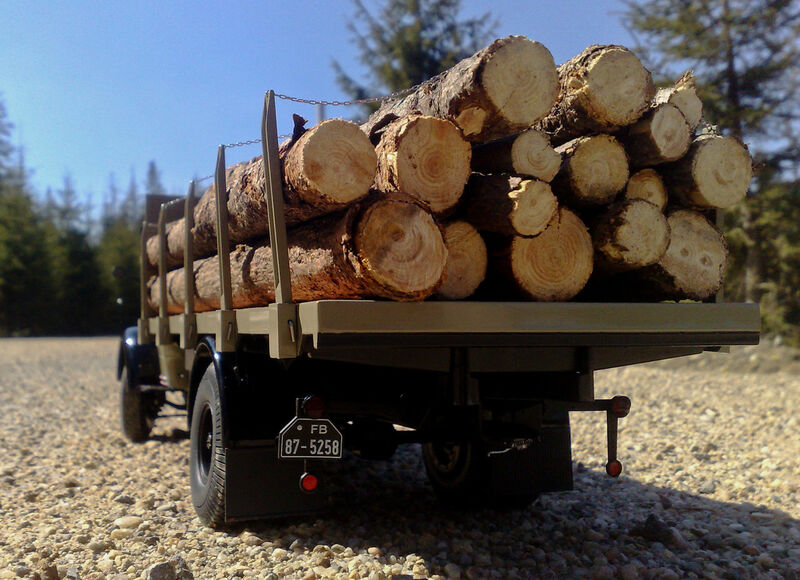 From the first look it seemed to be the right height, but I said to myself: “what would be the odds for this to be in 1:18th scale… but I’ll take it anyway”. I was pleasantly surprised by the way it was made. I couldn’t see this from the packaging at first, but it is very well made: it is all resin molded, the helmet, chest/shoulder plate and boots are painted glossy, everything else is matte and all the buttons, lightsaber or metal ornaments are very nicely painted. The cape is kind of thick, but you can’t tell this only when you inspect the figure in your hand. 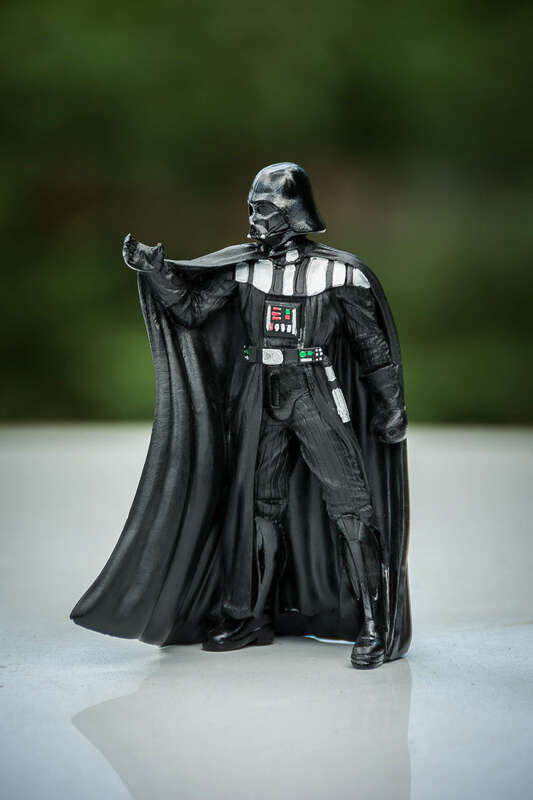 And after some research I discovered that Darth Vader was 2,02m in the movies, which should be about 11,2cm in 1:18th scale, and that’s how tall the figure is. Lucky me! I am not a fanboy, more like a fan, but I like these pop culture icons especially if they are as badass as Lord Vader himself. 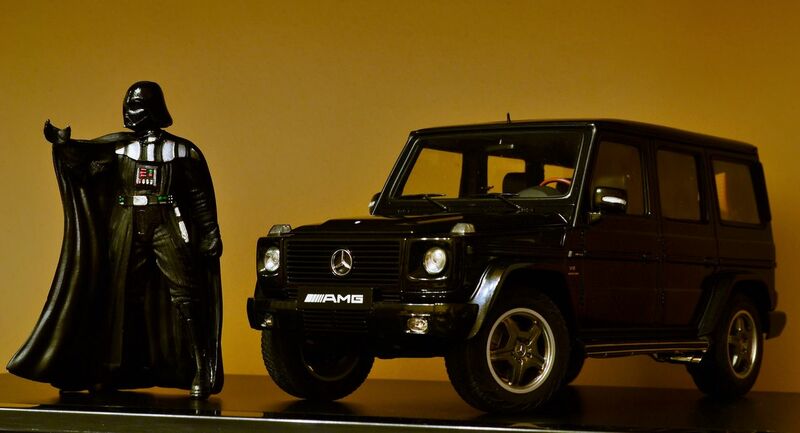 I immediately linked the figure to the “dark side” of my collection of Mercedes-Benz cars, the AMGs. I try to buy them mostly in that color, as much as I can of course of if they are available in black. Since the figure is in the “force choke” stance, I searched for a way to take some fun shots with it, together with my models. 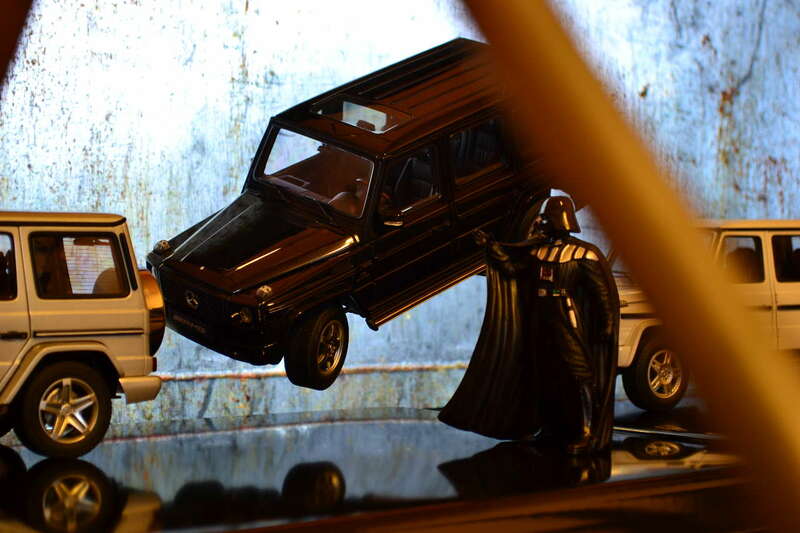 What better than a side parking, a Dark Side parking! After that is all about finding the right settings, a balance between the natural light, background light, shadows, reflections and composition of course. The only difficult part was to find a spot where to shot the scene from, a spot from which the wires weren’t visible. And also another downside of shooting something suspended with wires is that after each minor set modification, you have to wait for the objects to “settle down”. It was definitely a fun photoshoot and one I will remake for better results, now that I have a little more knowledge about the matter. I hope you like it! And of course, since it’s that day: May the fourth be with you! Some time had passed and I began to be drawn to photography, but I did not have a camera to obtain the desired outcomes. Actually, the attraction began when a friend of mine bought an entry-level Nikon DSLR and the results he got in terms of model car photography really impressed me; and the thing worth mentioning is that he used a pretty simple set-up: two softboxes and a heavy paper background. And to be frank with you, that is really the simplest recipe for a good studio shot. I set my goal to getting a camera like that in the then-near future. Of course, when you have a never-ending list of models to buy, the opportunity and budget for a new hobby is somehow permanently postponed. But when my friend decided to upgrade his gear and sell his first camera, I also decided to buy it in order to see if photography will catch on to me or not. I got my camera in the last day of the month, a perfect opportunity to take a photo and enter it in our forum’s monthly photo contest. 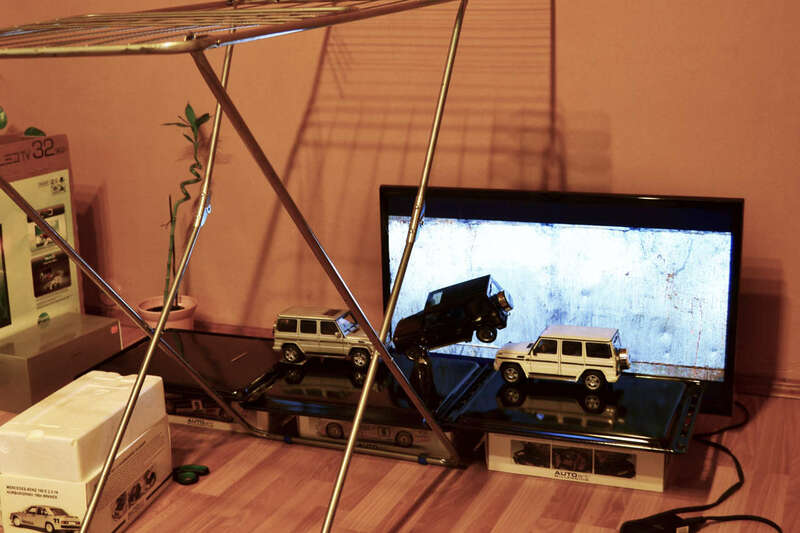 If I remember correctly, that month’s theme was something like “the relationship between a model car and objects in full scale”. 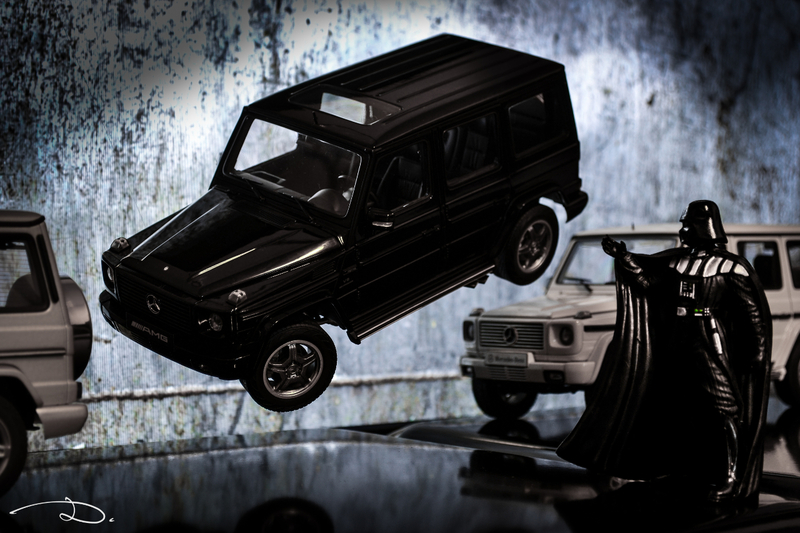 And of course, nothing I had around the house would have made a good background and a proper light source for a 1:18 model and that is why, for my subject, I chose a model in 1:87th scale: my Mercedes-Benz 170V made by BUB. Prior to my first experience with the DSLR, I made sure to make my homework and learn the basics regarding the use of it, which was totally new to me. Aperture, shutter speed, white balance, ISO value, were all pretty easy and logical to understand, but the first time you see yourself with the camera in your hands it’s not that easy to make them work together. This is pretty much the result I got that evening. It’s not a spectacular photo but I find it cute and I always like to keep the steps that marked my journey kept in a safe place. It always helps with the progress and yes, photography stuck to me! Well, at first it was all about collecting and sharing my new items on the forums for other passionate collectors to see. All the photos were extremely simple, on a flat surface or in a friend’s lightcube. 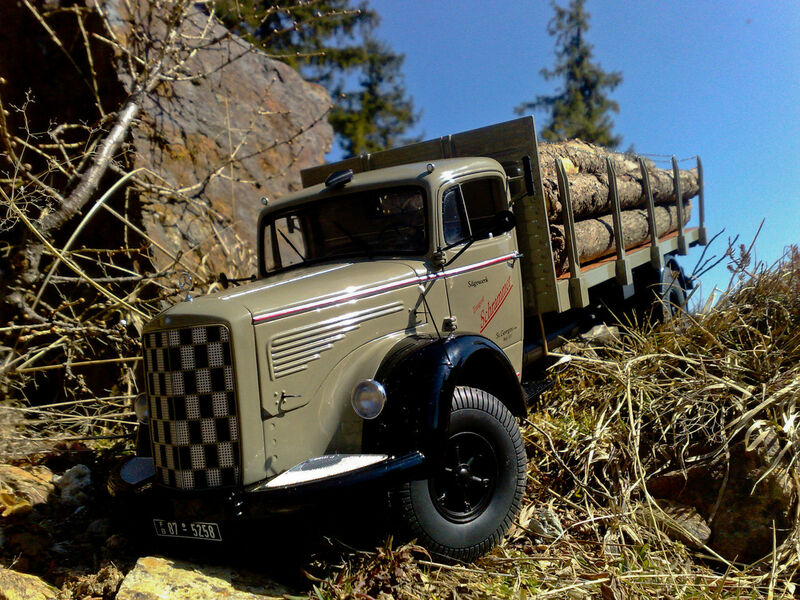 Yes, I took some models (replicas, don’t get the wrong idea) outdoors for a couple of times, put them on the road and try to make some realistic photos; I got some mediocre results, with the models not fitting into the background, so I dropped it. 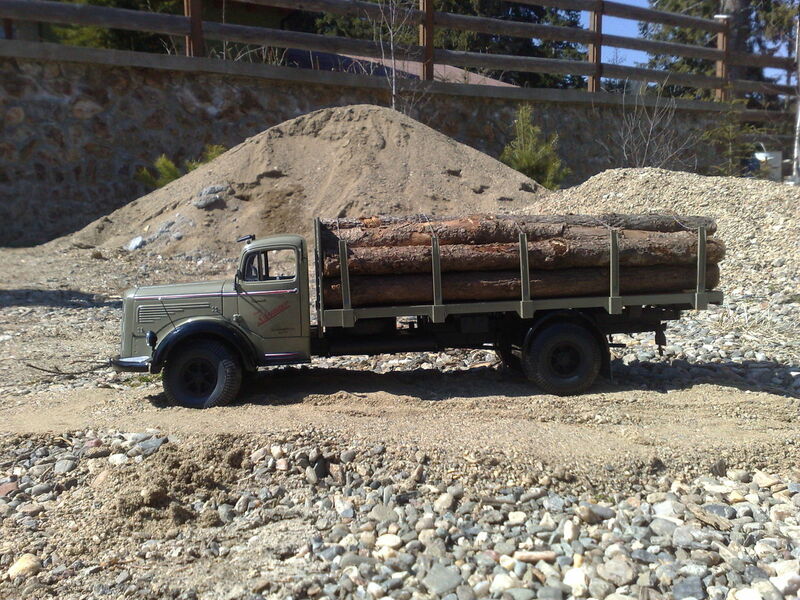 The “sets” in which I managed to integrate my truck were more than I could hope for at that time. I had my phone packed with a lot of shots and I was THE MAN. Pretty much an ordinary photo, that did not raise my attention back then. I got home, downloaded the photos, I cropped them, did some adjustments and I was ready to show my tremendous work to my fellow collectors on our forum. Feedback was good, but there was always that comment that used to bring me down to earth: “the grass is too big”, or “that thing definitely brakes the scale of the photo”. I treasure all these comments now even if then they were braking my chi. Where all this took me, I will try to show you in my future posts. Thank you for your time, and keep a close watch !